Importance of Your Challenge: Surviving The Shift! 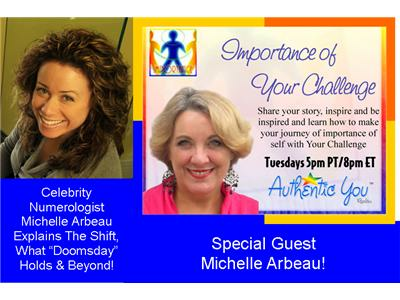 This week on Importance of Your Challenge is special guest Celebrity Numerologist Michelle Arbeau to talk about Surviving The Shift, seeing 11:11, Doomsday and more! Don't miss this pivotal episode as the end of the Mayan Calendar edges closer and 2012 comes to a close. What will 2013 have in store for us? Michelle Arbeau is an internationally recognized Celebrity Numerologist, author, inspirational speaker and radio/tv host. She has a Hollywood clientele base that includes Twilight vampires, Big Bang Theory actress, Pirates of the Caribbean actor, NBC Director, Celebrity stylist and many more. A media favorite and considered an expert in her field, Michelle is frequently a repeat guest on national outlets such as CBC Radio, CTV Morning Live and Breakfast Television. www.MichelleArbeau.com. Visit the official show page: http://www.AuthenticYouRadio.com/Importance-of-Your-Challenge.